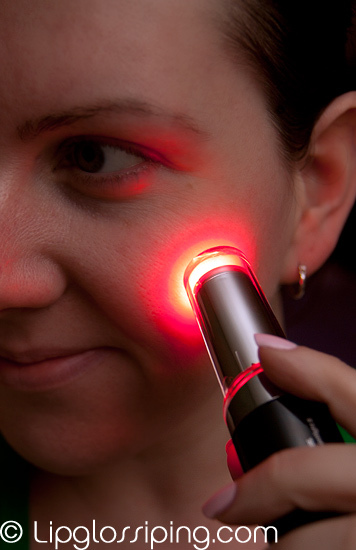 LMS Spotlights are described as a new skin care range that uses red light therapy, a natural skin treatment that’s clinically proven to help clear spots fast. A new “skin care range” seems an odd way to describe a device powered by batteries… I guess I’m used to “skin care ranges” referring to lotions and potions. Nevertheless, what we’re talking about here are three electronic devices that are designed to emit a red light that encourages spots to heal twice as quickly than they would without this ‘red light therapy’. A red light. That gets rid of spots. I had about as much faith in these devices as I did in my ability to doughnut-dodge. They’re also designed to look like cosmetic products (lipsticks, face compacts etc..) but I’m not too sure about that claim. They just look… like something I’d want to ask the owner what the hell it is to be honest. I don’t have acne and I don’t have particularly blemish-prone skin… but that doesn’t mean that I don’t get spots like the best of ’em. Infact, I get great big juicers that start as a lump under the surface before developing some nice bold colour and impressive prominence. Of course, at this point I do the only sensible thing and squeeze them… but nothing happens. They sit there, headless and mocking. For weeks on end sometimes. Whenever I do partake in a bit of squeezing, it angers the headless horror into getting more lumpy and sometimes turning a nice shade of purple for the duration of it’s takeover. Then, when it finally begins to flatten, the colour can often remain for a couple of months afterwards. So, whilst I don’t get regular breakouts… I still live in fear of one of these monsters invading purely because I know they generally move all their stuff in, get comfy and change the locks while they’re at it. The LMS Spotlights device* is designed to be used three times a day. If you own the smallest of the devices, you’ll need to use it for 3 minutes, whilst the others’ only require 1 minute usage at a time. You could be glamourous and tote this around in your handbag or do what I do and leave it on a shelf next to the loo. Let’s face it, we all need to pee and if we’re drinking enough water… then we should be doing it at least 3 times a day! Seems like a perfect place to spend a minute zapping your face in complete privacy to me! To begin with, I thought it wasn’t having any effect. And I don’t believe it was… I think I was holding the device too far away from my skin. It was only when I was sat at my computer one day that I felt this MOTHER of a zit appearing under my chin. I literally ran to the bathroom and grabbed my LMS device and in desperation, aimed it at my skin literally a cm from the surface. Within a couple of hours… the spot had retreated! Since then, I’ve been careful to focus the light tightly on the area that I’m wanting to treat. I can’t do a controlled test to see if the LMS Spotlights device is making a difference to the longevity of my zits but my instincts on it having a positive effect are enough to keep me using this three times a day, every day. In the time I’ve been using it (properly), I haven’t had a single spot last for longer than 3 days. Of course, this could be a coincidence… it really could, but I’ve been using it for about 5 weeks now and have been more impressed with it than I ever anticipated. However, I’m not the only one. I gave the largest of the three devices to my sister-in-law who unlike me, does have issues with blemishes and mild adult acne. The largest of the three devices is designed to cover a greater area of skin and she is in love with it. Which is a shame, because I’d really quite like it back now that I’ve fallen for my little one! When I saw her last week, she extoled its virtues and told me that she was only wearing a bit of concealer. I could see an improvement in her blemishes and also in the general evenness of her complexion. 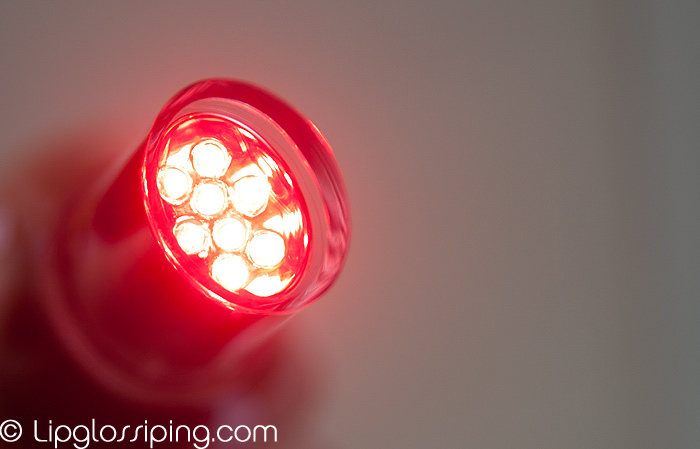 How does Red Light Therapy heal my spots? When cells are stressed (for example by a spot) Nitric Oxide levels increase which inhibits the cell’s energy manufacturing process affecting the skin’s natural ability to heal itself. The primary effect of the RLT in LMS Spotlights is to penetrate the skin cells to force out Nitric Oxide and stimulate anti-oxidants. This has been shown to reduce cellular stress and increase cellular energy (ATP) leading to improved healing and repair of the skin in a wide range of medical conditions including spots and acne. So, it’s not that it directly targets or ‘kills’ the spot… more that it dispenses with the stuff (Nitric Oxide) that inteferes with your body’s own healing process. I’m loathe to say that I’m convinced by this gadget purely because I can’t assign my recent good skin experiences to this device with absolute confidence. I don’t like to encourage hype around products that have the potential to affect quality of life without concrete proof… but I also can’t ignore the fact that my instincts are telling me that this is making a tangible difference to my skin. And that’s really all I have to go on. I’m going to keep using it and Hel, if you’re reading this… give it back give it back give it back, kthanksbai. 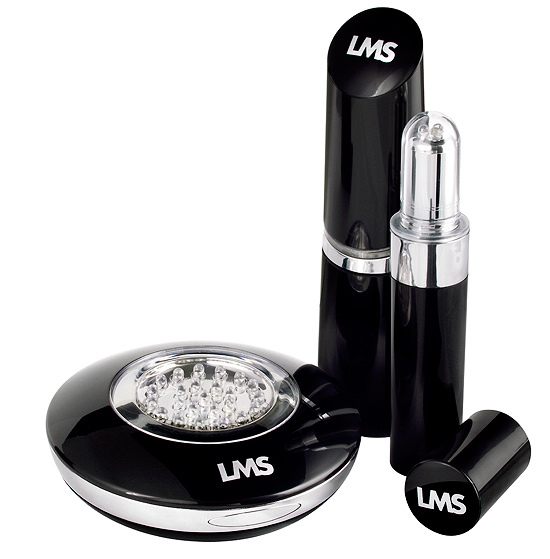 The LMS Spotlights devices are available online at www.lmsspotlights.com and at Harrods. Priced from £29.99. Impressed, I get the same headless wonders that combine hurtling like a biatch with doing nothing impressive at all, doesnt happen often but would be fab to have something to scare them away when it does! Sounds fantastic. I (thankfully) don’t suffer from blemishes, but will be passing this information onto some friends. LOVE, LOVE, LOVE your nail polish, what is it?? I am dubious about these sorts of acne gadgets because I had purchased a Zeno in the past (I know this worked on heat rather then light) and was very disappointed and had to return it. This sounds more promising and as the price point is much lower it does have more of an appeal. Sounds pretty cool but still sceptical about these gadgets. Like are they safe for long term use? Do you need to wear protective goggles when applying close to your eyes? I only get breakouts when I eat lots of sugar in any case (stupid hormonal reactions!) so will rather stay thin and diabetic free than use a home beam. loving the blog title, stroke of genius! Do they do an anti-ageing blue light one too? Wow, that looks kinda cool! Something that high-tech is definitely out of my budget though, and I don’t think we get those here. Hi Lipglossipping! Olivia here from LMS Spotlights, thanks for your lovely review. Just a quick tip for how to use it, results can be improved by holding the spotlight directly onto the skin, that way you get more concentrated penetration and less light is lost by diffusion. This will be on my birthday list!! !